I have started to introduce Maxine to baby food. It is fun for me and I think she digs it, too. Even when I am feeding her something she scoffs at, she is still interested in what we're doing and doesn't get upset. She looks at the spoon going into the bowl and I show her what's in the bowl and talk to her about what we're doing. She is not afraid to try new things, I guess. The first thing she tried was a tiny bit of ripe banana. She liked it but didn't know what to do with it in her mouth and just spit it out. She hasn't completely lost that tongue thrusting reflex yet. Next she tried rice cereal. She did not like this at all. I thought she was gonna puke on me. I think the texture grossed her out. 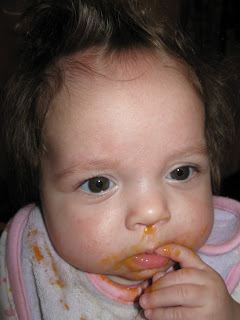 Then I gave her some sweet potato baby food. She liked this. It's probably her favorite so far. You would think everyone likes apples but Maxine did not. She kinda hated the apple baby food. 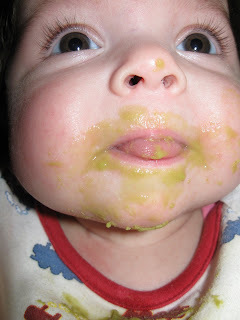 And today we did baby food peas. She didn't like it at first but after a few bites she stopped dry heaving and stopped making the yucky face and was actually eating the peas. I think she liked them after all. I feed her just one or two teaspoons of food at a time, only once or twice a day. Most of it gets spit out, either on purpose or on accident as she is still learning to eat, of course. When you open a jar of baby food you can keep it in the fridge for 2 to 4 days so that's how long we stay with one kind of food. Then I open a new jar of something else and try that for the next 2 to 4 days. 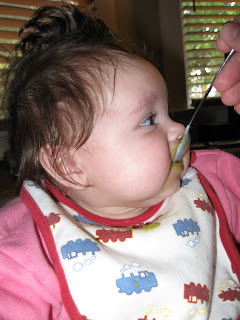 Since babies have so much saliva in and around their mouths it is best to not feed them right from the jar as this gets too much saliva in the food in the jar and starts breaking down the nutrients in the food, which is obviously not good. Interesting, huh? I just learned a new thing! I didn't know that last part. How much fun for Maxine to try all of these new flavors for the "first" time. I mean, she could have already known of some of the flavors when she was in your belly. She looks happy eating baby food. I know I ate lots of apples and bananas when I was pregnant. I ate sweet taters once on Christmas. I ate peas a couple times. You know what's difficult? Trying not to be prejudiced about veggies I don't really like, such as green beans. I'm not that crazy about peas by themselves either. I don't like cabbage too much, but I will eat it. I don't like broccoli it bulk. I can eat a little. And I can eat it especially if it's covered in some sort of Chinese food sauce aka MSG. And I like cabbage and brocoli! If it is a green vegetable and isn't lettuce or cucumbers, I don't like it. Good thing children don't like the dads food. :) HE HE. I love coleslaw but can't stand the smell of it. Smells like pedo. Funny, we like the opposite vegetables. Maybe that means you'll hate brussel sprouts. Thanks For The Lights, Jose! Busy Day but Have Some Pics, Won't You?